Although the month of August is generally considered a time for holidays, we have been busy enough doing our best to offer you yet another attractive model kits. 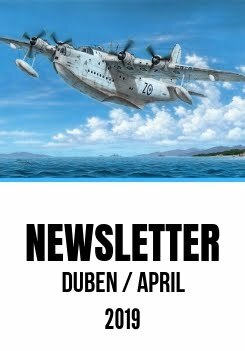 Except for the Bücker Bü 181, all the other August releases have been delayed a bit, but now all of them are being distributed and we are also glad to be able to bring you September news announcements now, the first of them being the 1/32 Tempest Mk.V model kit in a basic and cheap release. The Hi-tech model of the Tempest (SH32052) has literally vanished like vapour and the customers keep asking for possible future boxings with different Tempest versions. Well the Hi-tech Mk.II Tempest might be expected for a November release and the Mk.VI sometimes during next year. During WW2 the opposing sides were constantly competing against each other to keep abreast of the latest technological developments and as a result this led to ever more powerful and effective warplanes. In 1941 the new Fw 190 fighter began to enter service and the British hastily developed the Spitfire Mk.V into the Mk.IX with a better engine, and also introduced a new type called the Hawker Typhoon Mk.I into the service too. The introduction of the Typhoon fighter into service was rather complicated and as it also became clear soon that the Typhoon would not fit the requirements for a standard day fighter aircraft, the Hawker's chief designer Sydney Camm began to design an improved version which, because of the number of changes received eventually a new name, the Tempest. And became one of the best fighting machines of WW2. which is becoming almost sold out these days and now we would like to offer the modeller a basic version of the kit, which means it doesn't contain the extra bonuses of resin (PUR) and photo-etched parts. The plastic parts come via as many as eight sprues of grey styrene and one clear plastic sprue and the surface throughout benefits from neatly engraved panel lines and rivet details. During the build, the modeller is guided by a highly detailed A4-size full colour instruction booklet. The decal sheets (there are three of them) and the camouflage option schemes offer in total four different machines. The Camouflage A represents NV969 / SA-A machine flown by Sqn.Ldr. Warren „Smokey“ Schrader, DFC and Bar (out of his total 12 kills he achieved 9 and ½ in the Tempest). Camo B offers JN862/JF-Z adorned with invasion ID stripes and it was a usual mount of F/Lt. Remy van Lierde, DFC and Bar, a Belgian in RAF service with 44 victories over V-1 missiles. The third camouflage option is EJ705/W2-X with a smart kangaroo artwork on the fuselage side and was flown by Australian Plt. Off. F.A. Lang . The camouflage scheme option D brings the modeller SN165/ZD-V machine, in which cockpit it's pilot Sqn. Ldr. Emanuel Barnett Lyons, DFC experienced a rather arduous story with a fortunate ending. The decal sheets cater also for a complete set of stencils, including also items for the cockpit and the external fuel tanks. Special Hobby have been dealing with the Classic Airframes owner and bought all their tooling moulds and also the rights to produce Classic Airframes model kits. We are going to upgrade these models and put them, one by one, into our range. The very first of such models is the Fokker D.21. The Fokker D.21 fighter was designed for the use by the Dutch East Indies but because of the political situation it saw also some fighting over Europe. The FD-332 prototype took off for the first time in March 1936 and possessed rather high performance. Despite of that, the Dutch military hesitated with their order and waited until Finland and Denmark began to negotiate about possible licence rights for these fighter planes. (Finland produced their licence D.21s with two different powerplants, both of them are in our range of plastic models under catalogue numbers SH48073 and SH48078) In total 36 were eventually built for the Dutch military and these machines were, along with the twin-engined Fokker G.1, the very best which could the Netherlands use for its defence. The Fokkers were usually outperformed by their German counterparts which were the Messerschmitt Bf 109 and Bf110 fighters, but the smaller and lighter Dutch planes possessed much higher manoeuvrability which brought them sometimes an advantage in the combat. However, despite their heroic performance, the few Fokkers were not able to avert the occupation of the Netherlands. The story of the Fokker fighter in Denmark was even more sad as the Danish machines were not able to succeed against the German onslaught at all, the Luftwaffe´s attack was so sudden and surprising that the Danish pilots failed to take their machines aloft. And yet, the Danish aircraft might have had the most heavy armament of all Fokker D.21 versions as the Denmark´s military had been testing 23mm Madsen cannons on their machines. The kit comes on five sprues with styrene parts and one sprue of clear parts, there are also photo-etched parts, resin parts and a decal sheet. The decals cater for two Dutch and two Danish machines. In the morning of May 10, 1940, Dutch pilot Tlt. Bram "Bob" van der Stok in the cockpit of his machine with number 234 managed to shot down one Bf 109E and damage another one. Later, he would also become one of only three successful participants of the "Great Escape" from Stalag Luft III prisoner camp. The second of the Dutch machines with no.221 was also rather successful, in its cockpit Tlt. Herman Doppenberg achieved one victory over a Bf 109. The Danish camouflage options offer two machines, a camouflaged J-47 and a silver-doped J-42 with cannon pods under its wings. Our 1/48 Junkers Ju 88C-4 kit (SH48177) have already been announced too for a September release. Our team is still busy preparing this model for the production and we will offer more information on this release in a special issue of our Newsletter. Also please note that our models SH48136, SH72257, SH72264 and SH72272 are almost sold out and there are only very few of them left now. Once definitely sold out, we are not going to issue them any more. Detailed cannon barrels resin cast parts depicting both types used with the Tempest. The long barrels fit only the Tempest Mk.V ser.1 aircraft while all the later aircraft were fitted with shorter barrels. Nicely detailed resin later type wheels with smooth tyres and realistically weighted appearance. Nicely detailed wheels with weighted tyres for the Typhoon fighter and early series of the Tempest. Realistically weighted and nicely detailed tail wheel with its leg, made to fit Typhoon and Tempest models. The leg itself is cast from special heat-hardened resin material to endure the weight of the model and not to get broken or bent. Tailored to fit Special Hobby kit, if Pacific Coast model is to be used the modeller is advised to adapt the tail wheel leg attachment point in the fuselage. Finely detailed pilot's seat cast with the belts. Suitable for Tempest or Typhoon models. Nicely detailed pilot's seat made to enhance the detail levels of your Typhoon or Tempest models. Widely used type of gunsight that was used in war-time Tempest fighters and many other Britain's fighter machines. Nicely detailed resin cast undercarriage legs for Special Hobby Tempest kits. These legs are not only more detailed than the plastic ones, but being made from special heat-hardened resin material they also possess some extra rigidity. Realistically detailed figure of an Italian Fiat G.50 fighter pilot posed sitting in his seat.